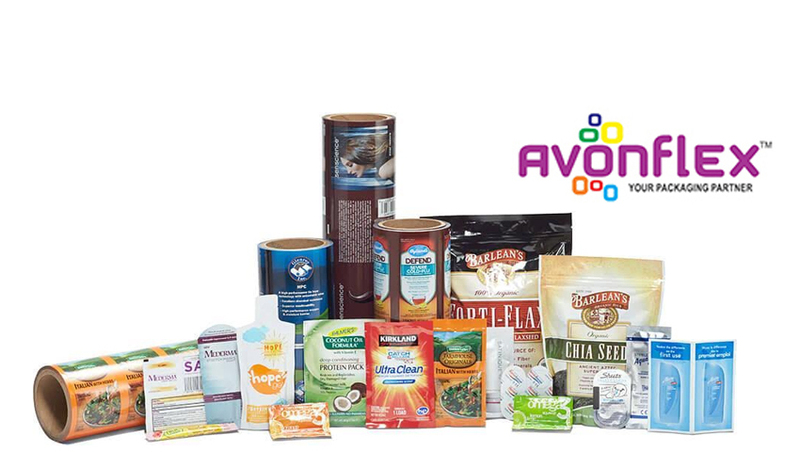 Equipped with sophisticated machinery and driven by advanced technology Avonflex is fully geared up to create innovative packaging solutions to meet ever-changing demands of our customers. That could mean anything from enhanced convenience, improved functionality to simply creating a visually alluring experience. And to top it all, AVONFLEX has a sophisticated logistics system that enables our products to reach customers in the most efficient way. Unit 2 – Located at Shadnagar which is 30 Km. from Hyderabad International Airport. Multi-layer blown film extruders with total production of 250 tons P.M.
8- colour Rotogravure printing machine with turn-bar, line speed of 250Mtr/min. 8- Colour Rotogravure printing machine with line speed of 150Mtr/min. Auto registration control (ARC) which give natural impression to your package by enhancing picture quality with high precision. Defect Inspection machine with line speed of 600 Mtr/min. 2 Solvent less Lamination machine with line speed of 375 Mtr/min from Italy. Solvent base lamination machine with line speed of 200 Mtr/min. Universal Slitting machine which can slit paper, low and heavy gauge laminated material with the speed of 600Mtr/min. Pouching machine which can manufacture pouches as per requirement.